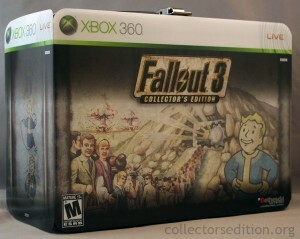 I remember when I first noticed that Amazon.com was selling an “exclusive” Fallout 3 Survival edition. 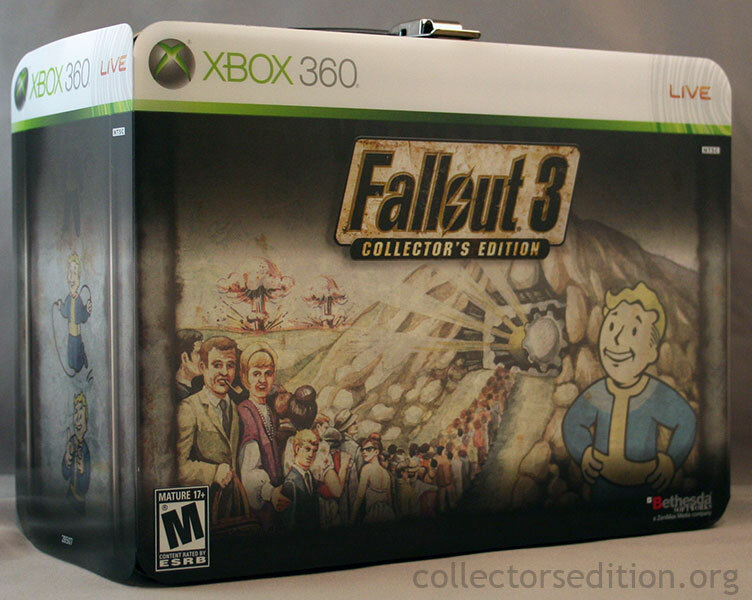 I had already pre-ordered the Collector’s Edition at my local GameStop. Pouring over the details I came to the conclusion that it was nothing more than the Collector’s Edition along with a clock shaped like a Pip-Boy. That seemed cool, however it was a whopping $50 more than the Collector’s Edition, double the price of the standard edition, which made for a damn expensive clock. It was unclear whether they were even boxed together or if you were just shipped the clock like a separate pre-order bonus. I decided to pass because I didn’t need a $50 clock, though I came to regret that decision. It wasn’t until some time later that I actually saw a picture of the Survival edition, and I decided that I needed to have it in my collection. It did indeed come in single box and the box was very much appropriate for the game, the plain cardboard with simple black print made it look like an artifact out of time and while I held the lunchbox Collector’s Edition to be one of my favorite CEs, the decoration of the Survival Edition box was much cooler in every way; even the console branding is somewhat “tarnished” in appearance. 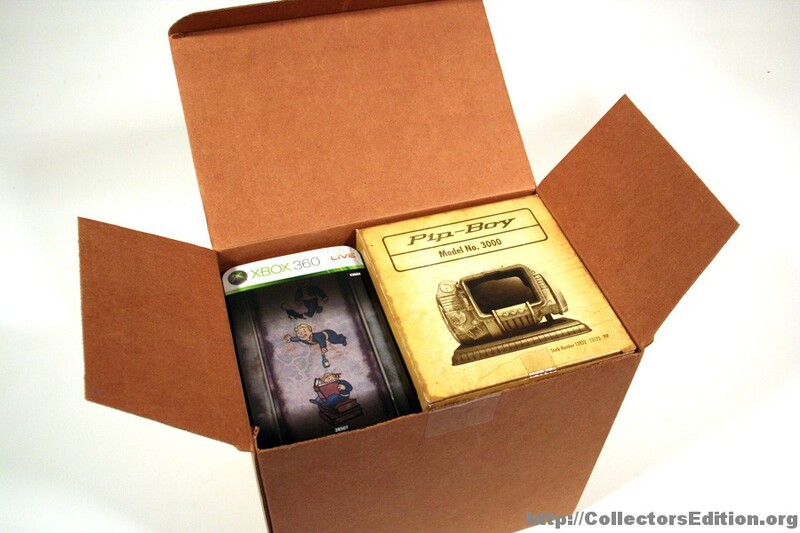 Inside the box is what you’d expect, the Collector’s Edition alongside a smallish cardboard box with the pip-boy clock. Again, we’re treated to a highly decorated box that looks like it’s been sitting on a dusty shelf since the 50s. 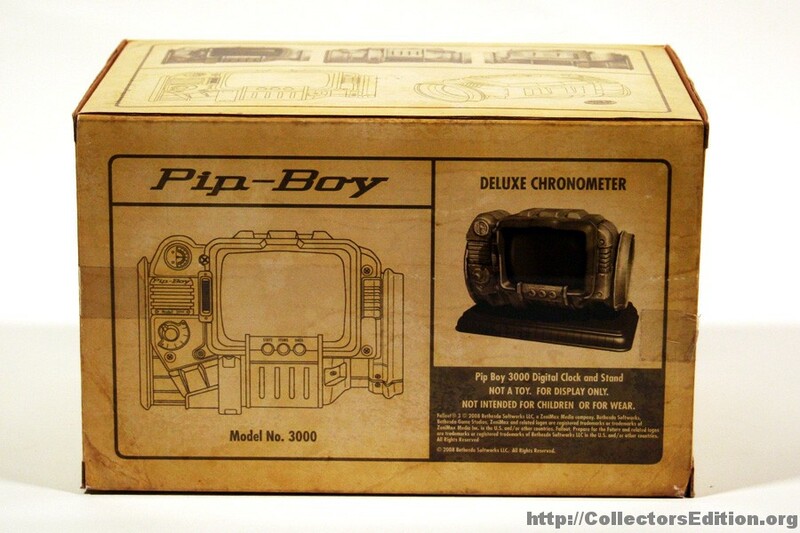 Unlike the outer box, which is just plain cardboard with a decorated cardboard slip-cover, the pip-boy box is actually decorated on all sides. 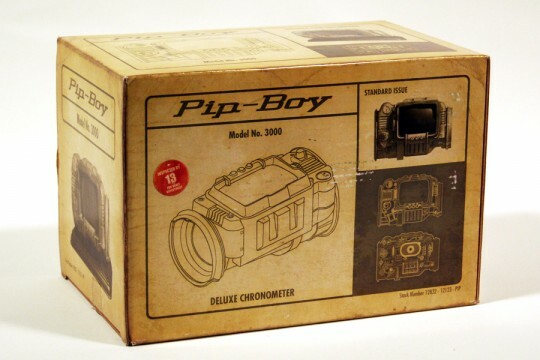 The design of the pip-boy’s box is what you’d imagine the product box for a real life pip-boy might look like. It shows off the “product” from multiple angles and has some schematic type images and other details such as a fake “inspected by” sticker. I think what makes a CE release truly special as opposed to just a game with some trinkets is the attention to detail in the packaging. 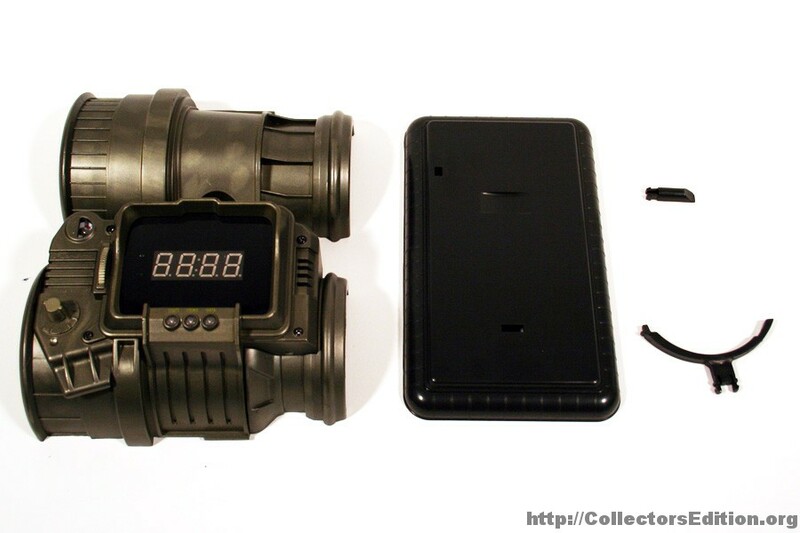 While games like Call of Duty might include some cool items like night vision goggles or a camera equipped r.c. car, the packaging for those CEs is severely lacking. The outer box has some thought but as soon as you open it up it’s as if you just bought a child’s toy; it cheapens the experience significantly. 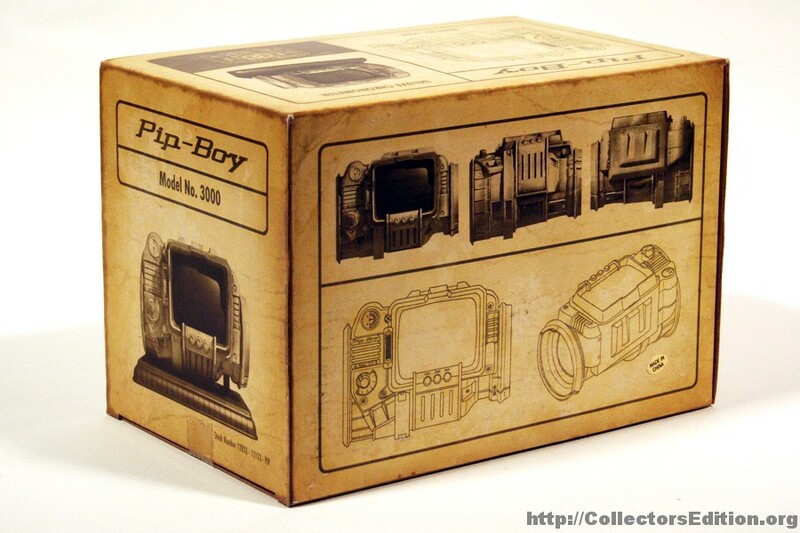 By comparison look how much effort went into the detail of Pip-boy box, they went out of their way to decorate it appropriately on all sides. I hope the team behind this CE knows their efforts didn’t go unnoticed; I hope other teams building CEs now take note and put as much effort into carrying their theme into the packaging and not just boxing it up like it’s some generic product. Inside the box you’ll find some bubble wrap to protect the pip-boy clock (one of the very few in-authentic aspects of the packaging). Also, in addition to the clock there is a stand that consists of three simple pieces. The clock itself is cylindrical, it has a hinge and a clasp and if you have very slender arms you could probably wear it, though the packaging tells you explicitly not to. 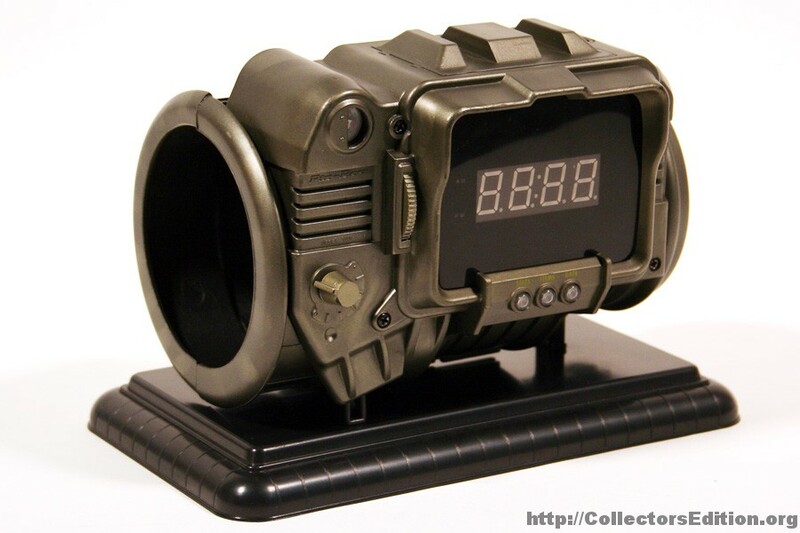 I’ve actually seen one where someone had modified their clock and fitted it with an iPod Touch complete with a theme to make it look like the actual pip-boy display. The collector in me cringes at the thought of hacking up the content of a CE, but the part of me who likes to tinker with things thinks it’s a really great idea. The clock is extremely detailed I believe they used the actual in-game 3D model to create the mold used to produce these. 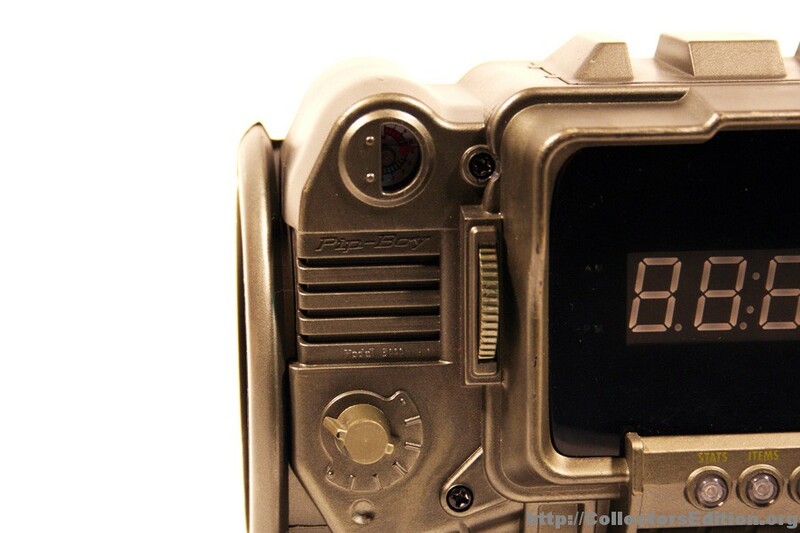 Below the display there are three buttons that light up, these are labeled with pip-boy functions but they are actually used to set the time. To the left of the display there is wheel and a knob, both of which you can move but they are not attached to anything. In the upper left is the radiation meter, which looks to be an actual working compass. 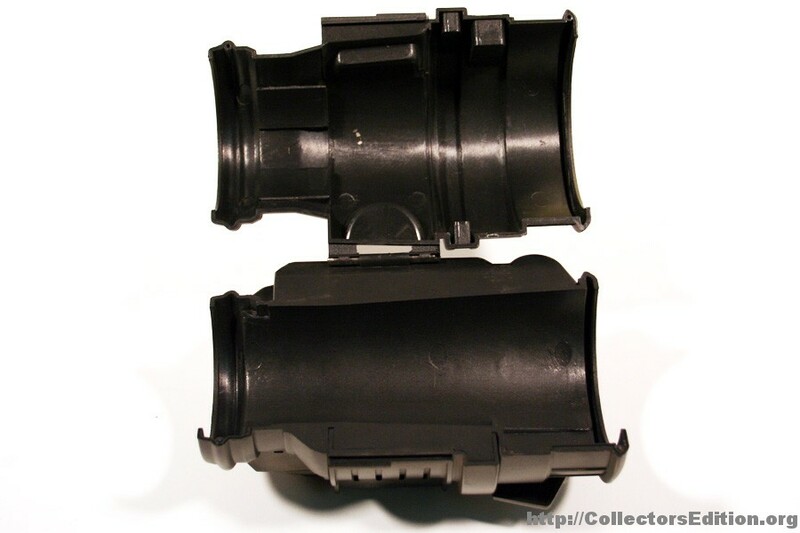 Batteries are not included though they are inserted on the top behind a small door that is held in with a screw. I believe it takes 3 AA sized batteries. 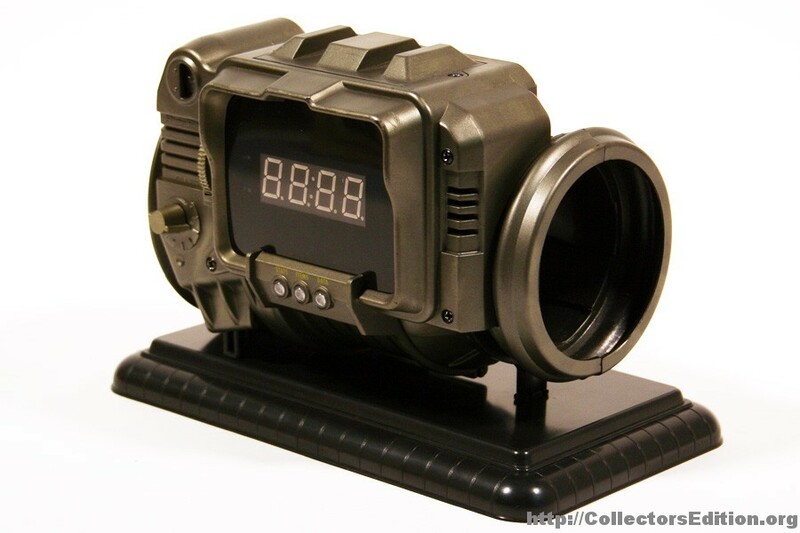 Sadly my clock doesn’t function but those that I’ve seen that do work light up the numbering and buttons in an electric green similar to the old “green screen” displays used throughout computer equipment in the game. Perhaps the most special thing about the Survival Edition is it’s rarity. Bethesda published a developer diary on the Survival Edition’s inception and they mention that it was produced in “very limited quantities”. Due to how infrequently these seem to pop up for sale and the price they fetch on the used market, I tend to believe it. 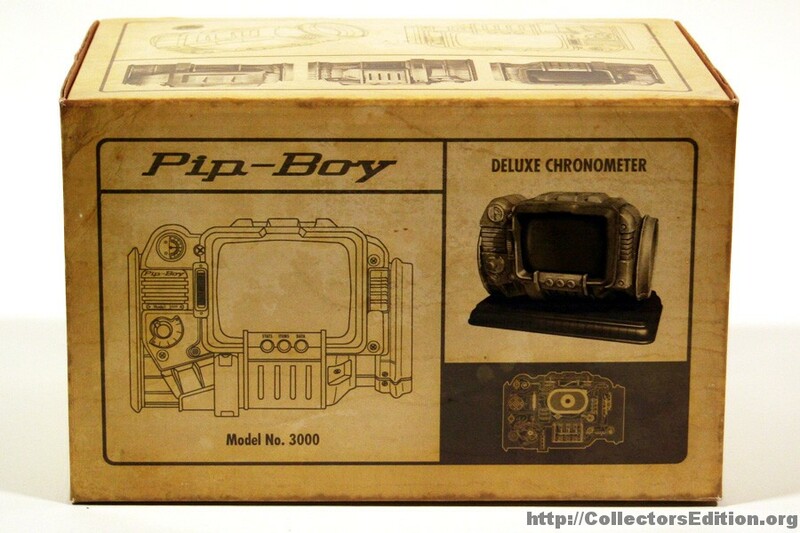 Of course we can’t forget that the Survival Edition isn’t just a nice box with a pip-boy clock it, includes the entirety of the Collector’rs Edition release as well. I’m writing this unboxing because I wanted to share with you the details of the Survivor Edition; one of the favorite CEs in my collection. The Collector’s Edition saw much much higher production and was available just about everywhere, so I wont go into the details, but it is an excellent edition in and of itself. If you haven’t seen it and would like to, you should visit it’s page in the database. 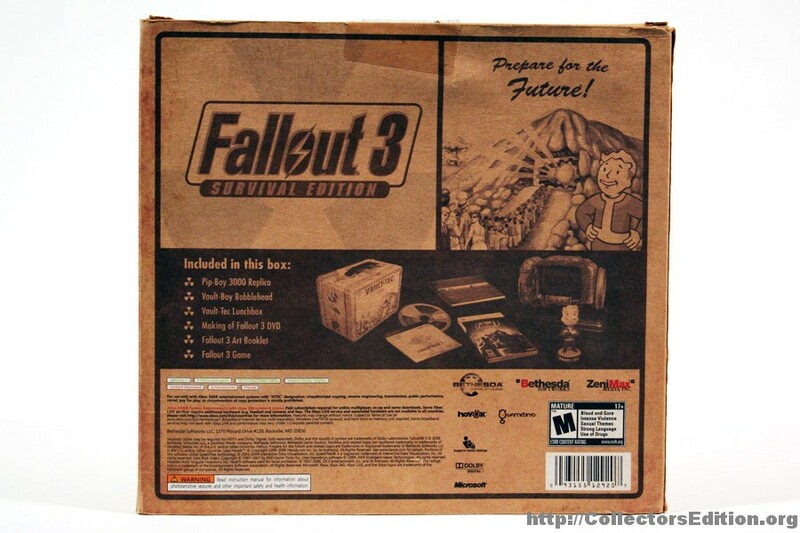 The Survival Edition of Fallout 3 was sold exclusively through Amazon.com. It was released on October 18th 2008 on Xbox 360 and PS3 at a price of $129.99 and on PC at a price of $119.99. So I finally go around to taking pictures of my Survival Edition, I decided I should do a little unboxing write up. Please let me know if you liked it, what you didn't like about it, and what games you'd like to see me do this for in the future. I really liked this, you went into much more detailed and gave your opinion on the contents and packaging. Would love to see more, especially the rarer ones. Better late than never right! An excellent unboxing review twisted, thank you. 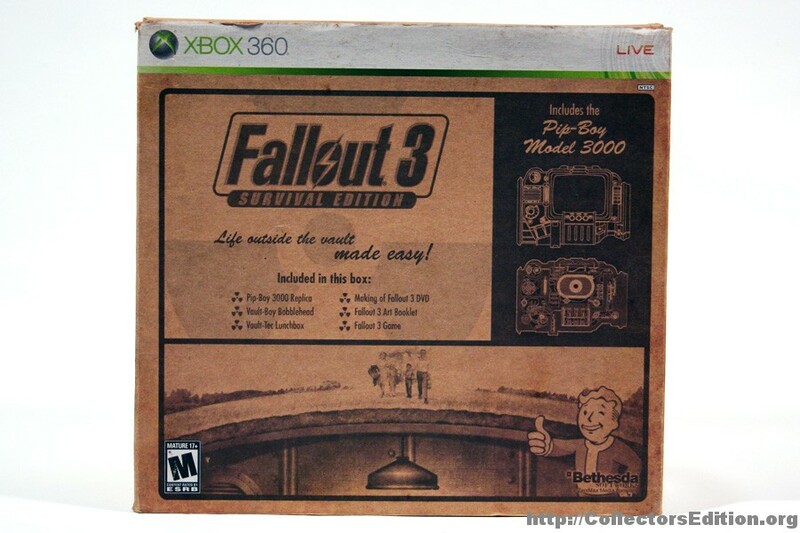 I greatly appreciate your insight regarding this particular "Survival" Edition of Fallout 3. 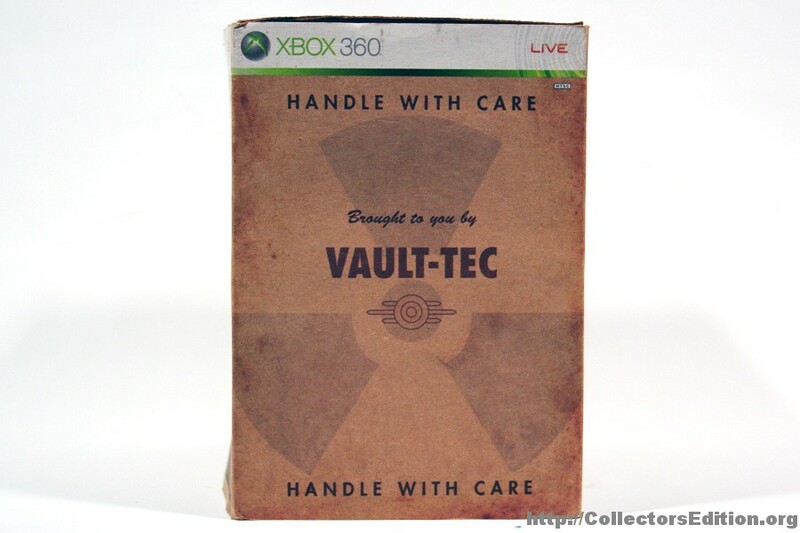 I too did not realize there was this Survival edition until after I had already pre-ordered my Collector's Edition. By the time I got around to looking for the SE it was unavailable on Amazon and so I searched on eBay. It seemed difficult to find the Xbox 360 version (which is usually how 360 games are for CE's - always more rare in my experience), but at last one day I found one and it was in *perfect mint condition. I was BEYOND excited and snatched it up instantly. I have been the proud owner of this Surival Edition for quite some time now and I must say, it too is one of the most beloved pieces of my Collection. I really wish those involved in designing these Collector Editions would take the time, as you said, to carry the theme of their game or movie into the packaging and not just the collectible inside. 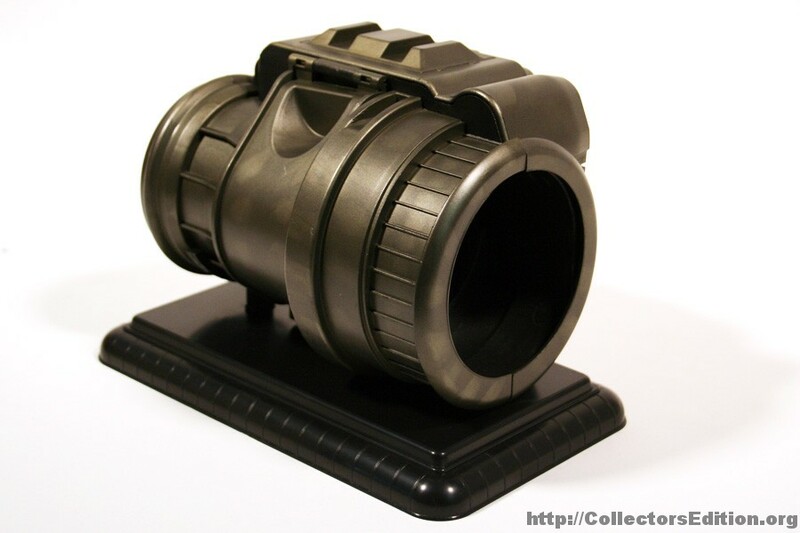 Often times, for collector's like myself (or you) we don't want to open our collectibles and so how the packaging is designed and presented means a great deal to us. 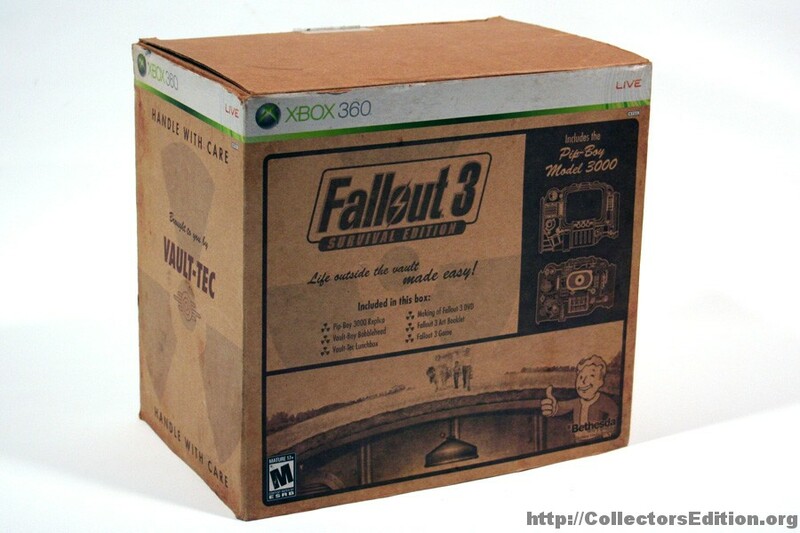 I'd have to say that the Survival Edition of Fallout 3 is one of the best packaging designs I have ever seen. It really provides a genuine feel of nostalgia and 50's noire. Makes you all gitty inside doesn't it? excellent review. i like how you detailed the content.